A logistics and distribution site which has proved a magnet for major brands is to be joined by a new development of more than 150 acres. Barnsdales are inviting bids to develop West Moor Park East, which sits across Junction 4 of the M18 from the successful West Moor Park. Jason Barnsdale, Managing Director of the firm, said the calibre of businesses attracted to West Moor Park coupled with the regeneration in and around Doncaster is adding to the appeal of the new site. Blue Anchor Leisure Ltd of Skegness own the site and are working with Barnsdales to explore options for industrial and leisure use. The bulk of the area is 118.64 acres of grade 3 agricultural land which sits next to a site of 32.61 acres also owned by Blue Anchor and currently used by FatCat Moto Parc, who have a lease until 2020. 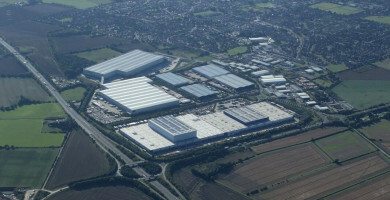 Current occupiers at West Moor Park include Ikea, Next and ABP Food Group. Jason said: “West Moor Park is home to some big names and big businesses and the variety is an indication of the breadth of appeal of this location. Furniture, fashion and food all have a strong presence. “Elsewhere on the site there are thriving businesses working in the motor trade, the construction sector and office supplies. West Moor Park East offers opportunities on a scale which can accommodate the biggest operators in everything from logistics to leisure. “Blue Anchor Leisure has decided to sell the site because of the level of activity and confidence in and around the Doncaster area. There is nothing like this on the market in the region and we are inviting bids with a deadline of 5pm on Tuesday 28 February.